Always photo heavy when it's a Uniqlo post. It's hard to pick which ones to leave out especially this Spring/Summer 2014 with genius collaborations from Pharell, SPRZ NY, and Ines De La Fressange. Renowned musician and music producer, Pharell Williams puts his spin on the UT Spring Summer 2014 collection with his "I am Other" creative collective. Revisions have been made to the body of the new model t shirts themselves, with a carefully selected assortment of graphics. Under the stern eye of street fashion icon NIGO (Bape), recently hired as creative director, the 2014 Spring Summer collection will comprise approximately 35 themes, including 18 new collaborations, with more than 1,200 colors and patterns for men, women, and kids. UNIQLO became a multi-year, corporate sponsor of MoMA, home to one of the world’s greatest collections of modern and contemporary art, in May 2013. At that time, UNIQLO became sponsor of the Museum’s Friday night free admission program, now called “UNIQLO Free Friday Nights”, which provides increased accessibility to the Museum’s exhibitions, collection and film programs. To further its continued support of MoMA, UNIQLO is presenting the MoMA Special Edition items, inspired by artwork from the Museum’s collection and new designs specially made for SPRZ NY in collaboration with living artists. The MoMA Special Edition designs are based on the works of the world-renowned Andy Warhol, Jean-Michel Basquiat, Keith Haring, Jack Pierson, Jackson Pollock, Lawrence Weiner, Ryan McGinness, and Sarah Morris. The Ines De La Fressange for Uniqlo line is comprised of basics that you can endlessly mix and match with no fault. They have that effortless chic that Parisiennes exude in a cool palette of blue, white and red that is perfect for summer. It is filled with timeless pieces for all your different needs - be it work, play or holiday plus they are all extremely wearable and flattering on all shapes and sizes. It is definite "must check out in a hurry" because it is totally the type of collection that gets sold out in days. 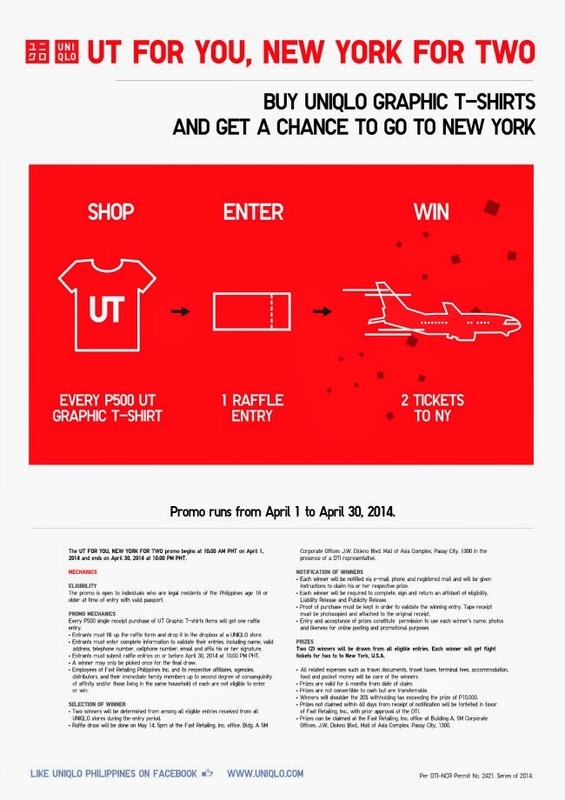 Every P500 single receipt purchase of any shirt from the UT line entitles you to a raffle ticket and a chance to win a roundtrip ticket to NYC!!! Fill out the form and drop it in designated drop boxes on or before April 30, 2014 to qualify. 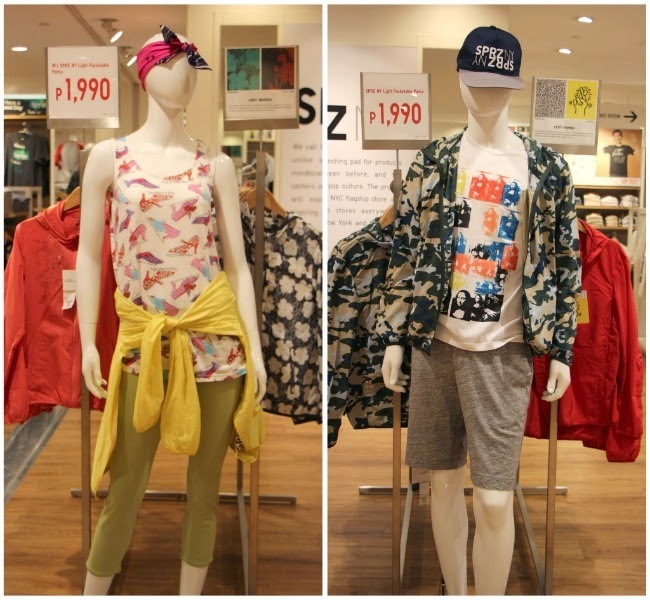 Also not to be missed is UNIQLO’s ongoing UT gallery on display in the Mega Fashion Hall Atrium at SM Megamall from March 28 to April 6, 2014. Discover 100 limited-edition t-shirts featuring renowned designers, iconic brands and beloved cartoon characters making a fashion statement at the heart of Manila’s global fashion mecca. For more information, see poster and flyers for details or visit a UNIQLO store near you.